The Toronto Maple Leafs announced Thursday that they have signed defenceman Jesse Blacker to a standard three-year entry level contract. He will report to the Toronto Marlies of the American Hockey League (AHL) tomorrow. 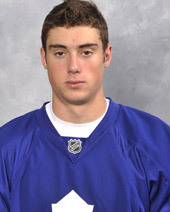 Blacke r, 18, was originally selected by the Toronto Maple Leafs in the second round, 58th overall, in the 2009 NHL Entry Draft. He played in one preseason game for Toronto in September. Blacker skated in 57 games this season in the Ontario Hockey League, posting 33 points (six goals, 27 assists) and 74 penalty minutes. The Toronto, Ontario native played in 48 games with the Owen Sound Attack, recording six goals and 24 assists to go along with 62 penalty minutes. The 6’1, 190-pound defenceman appeared in nine games with the Windsor Spitfires at the start of the season before being traded to the Attack, registering three assists. His second season with the Spitfires in 2008-09 culminated in a Memorial Cup Championship after 20 post-season games. The Marlies host the Hamilton Bulldogs, AHL affiliate of the Montreal Canadiens, on Saturday afternoon at Ricoh Coliseum at 4 p.m. On Sunday, the Marlies face-off against the Abbotsford Heat, AHL affiliate of the Calgary Flames, at 1 p.m. The game will be broadcast live on CBC. Fans can listen to all Toronto Marlies regular season games on THE FAN 590 or fan590.com. For ticket information, including season ticket packages and group seating, visit www.torontomarlies.com or call the team’s ticket line at 416-597-PUCK.